Finally taking a few moments to relax following a stressful, but blissfully uneventful weekend, the man overseeing the unlikely merger between Firefighters and Motorcycles offered his assessment. "We accomplished some of the goals we were looking at as far as the staffing on them," said Captain Craig White, head of the Los Angeles Fire Department motorcycle pilot program." 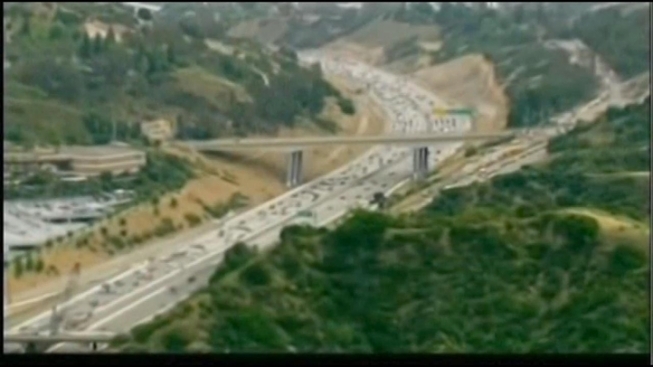 The field tests for the two fire paramedic teams took place during the 405 Freeway closure. Fire commanders said the bikes are more mobile than conventional engines, which allows for faster and easier access to accident victims in emergencies. They may soon be deployed at scheduled events such as the Los Angeles Marathon or during days of high fire danger. Of course, one thing they will not do is replace the water and equipment carrying capacity of a fire engine. "What they were put in place to do was to provide medical care in case we had a medical emergency," says Capt. White. "And also they would be the eyes out there to provide the intelligence back to the command post on what was happening." The teams were tested on both sides of the 405 during the shutdown. They patrolled a 20-square-mile area from Ventura Boulevard in the north to Sunset Boulevard in the south. And they were on call from Beverly Glen west to the city limits. "My people are for pole vaulting over walls or hang gliding if that's what it took to get the service there," says Pat McOsker, who also notes that a similar program using bicycles in up and rolling.